A view of the resistance welding shop at Lynn Welding. Photo courtesy of Lynn Welding Co., Inc. The challenges of high–risk, high–reward jobs are all in a day's work for the people at Lynn Welding Company, a specialist in Nadcap–approved fusion welding, resistance welding, and brazing. Lynn Welding Co., Inc. employs 46 skilled workers in the rarefied atmosphere of high–risk, high reward welding, frequently inspected daily via X–ray nondestructive testing (NDT) and fluorescent penetrant inspection (FPI) to ensure that parts meet the strict aerospace welding standards set forth by their customers. For one recent customer, Lynn manufactured a heat exchanger about a foot tall by two feet long, with 80 inches of welds for use in the oxygen system on the International Space Station, said Darius Kania, vice president of Lynn Welding. 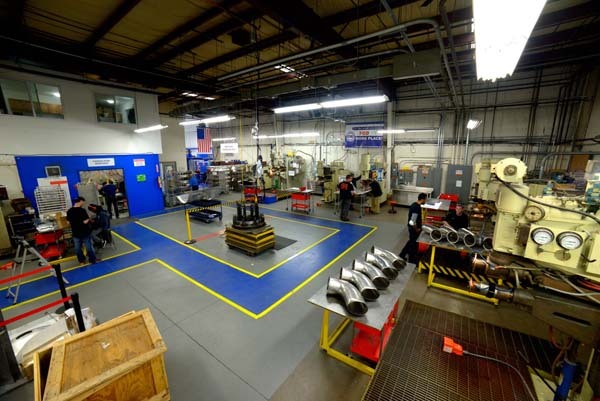 Kania spoke to reporters on a recent visit to Lynn Welding's factory in Newington, Connecticut, and also communicated via emailed responses. The space station aluminum part had to reach the Class A Standard by passing an X–ray and an FPI non–destructive test. Before the part reached Lynn, the customer hired another welding firm and spent thousands of dollars trying to rework the part, but they could not get the porosity out of the welds. After reworking it, X–ray testing it, and reworking it again, the part fell apart from being reworked so many times. That's when the customer hired Lynn. "When the customer came here, they were worried–they were nervous," Kania said. But for Lynn Welding, hearing that the part had to pass an X–ray test didn't worry anybody. Lynn runs a shuttle van twice a day to its vendor for X–ray testing and fluorescent particle inspection. "It was so funny because after they left, our welding foreman and I looked at each other and were like, 'This is a big deal?' and he said 'No, we could do this [easily].'" Kania gave the drawings and the part to Lynn's best engineer and to its best welder, and they talked it over. "That's what we do," he said. "For high risk, high reward parts, we go to our best workers." Company engineers met with customer engineers. Welders met with welders, as necessary. Lynn's welding foreman, Erik Colon, said he discovered that welding was his passion about 15 years ago. He enjoys building something from nothing. He loves to weld and he loves solving problems. "We reviewed the part. We came up with our fixes, how to do the part, first approvals, checking dimensions," Colon said. Kania asked him what the big deal was with the part–namely, why the other company couldn't fix it. Colon replied that the part wasn't any tougher than most of Lynn's parts. "What's a real challenge is a five–day turnaround when we have multiple hours working on the fixturing." Ryan Sheridan, a resistance welding specialist at Lynn Welding, uses a Sciaky resistance welder to weld sheet metal for an aerospace application. Photo by Mark Langlois. Lynn Welding's design engineering department designs and builds its welding fixtures, used for assembly and workholding. Kania said that Lynn provides this service to meet its own internal requirements, as well as to meet external customer requirements. "I took it into my work station, pulled the curtains to prevent air gusts," Colon said. Limiting the air movement is important because one cause of porosity is the presence of hydrogen. A ceiling fan 25 feet away can create an indoor gust of air that disturbs the argon gas atmosphere around the weld area, which might affect the quality of a part. When the argon gas that surrounds the weld pool is disturbed, it can introduce the hydrogen from the air into the molten weld pool. The hydrogen causes porosity in the weld, which is very bad for weld quality and strength. "They had a lot of money into it already. We do X–ray jobs every day," Colon said. He knew Lynn could do it. Kania described quality welding as finding the sweet spot between heat and distortion. Too little heat and the weld will not have adequate fusion and penetration, and porosity is greater. Too much heat and the metal can lose strength, and the part becomes so warped that it isn't meeting tolerances. "There's a very small window of success when you're welding aluminum. Either you're not hot enough and you're not getting penetration, or if you stand on the pedal too much, you're blasting right through the part. It's a small window you have to stay within," Kania said. Kania said welding is part art, and the best that a robot can do is weld a straight line or circumferential bead with parts that are highly machined and consistent. "A robot can only be programed to make a straight line weld and stop," Kania said. "But when a welder is welding, and he realizes that he's coming across a weld and there's a gap there–now that gap is wider. Now he's got to slow down, and now he's got to bridge that gap with the weld wire. The robot doesn't do that. The robot just blasts through the part, and there's a lot of issues. The kind of welding that we do is more complex, intricate welding." 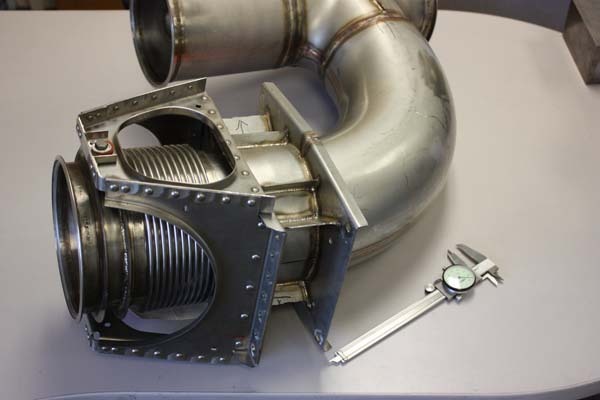 An aerospace air duct that was resistance welded and fusion welded at Lynn Welding. Photo courtesy of Lynn Welding Co., Inc.
A person, a quality welder, whom Kania called an artist, looks at their work and adjusts constantly to improve it. "We actually welcome tight tolerance jobs for the challenge of it," he said. "Our typical aerospace parts have a tolerance of five thousandths of an inch (0.005 inch) after welding. We understand that our customers have invested a lot of money and time into their parts. Some of the parts we get are worth $50,000, and that is before we strike an arc to the part. And that is precisely why we are so good at what we do–it's because we really do understand the value of our customers' parts and we treat them very gently. "On many of our assemblies, we work with the customer to develop what the machined components should look like before welding, so they can reduce shrinkage or warpage from the thermal input of the welding process," Kania added. Kania is a certified welding inspector (CWI), which means the American Welding Society (AWS) has trained him to certify the quality of welds. "We have the capabilities to resistance spot [weld], seam [weld], and stitch weld all material groups to Class A requirements," he said. "We have resistance welded aero structures for the A–10 warthog, F–16 eagle, B–52 bomber, and even the international space station." Kania explained that his certification from the American Welding Society means he has the training, skills, and responsibility to ensure that a weld meets all of the acceptance standards required by the customer, which, in the aerospace industry, is something that human lives depend on. Welders at Lynn Welding are also certified as AOG (aircraft on ground) welders, meaning the U.S. Federal Aviation Administration (FAA) has certified them to be called up on a moment's notice to repair–weld a part for an aircraft that is sitting on the tarmac. "They are drug–tested and certified to the highest standard," Kania said. "Lynn Welding has a very diverse team and we tend to focus on the strengths of each of our employees," he continued. "We have welders that are X–ray quality experts in the welding of aluminum, and others who are experts in X–ray quality welding of titanium. Our inspectors and engineers all come from a long background of aerospace welding. Many of our employees are constantly being trained and then promoted from within. We have certified welding inspectors (CWI) on staff as well. Our quality team is extremely detailed and very experienced to deal with all of the compliance requirements of our customers." Lynn Welding's timeline is one of growth and quality improvements. In 1979, Jim Inglis started welding brackets in his garage on one TIG welder. In 1981, he incorporated Lynn Welding and named it after his daughter. A year later, he opened a shop in Hartford, Connecticut, later moving it to Glastonbury before opening a second location in Granby. In 1983, he invested in Sciaky resistance welders, laying the foundation for an important service that Lynn Welding provides today. In 1984, Lynn Welding entered the aerospace market. Today, the company has a long list of aerospace clients that include Boeing, Rolls–Royce, Gulfstream, Kaman, Hawker Beechcraft, Pratt & Whitney, Raytheon, and Bell Helicopter. Also included among them are General Electric, Sikorsky, Hamilton Sundstrand, Westinghouse, and General Dynamics. In 1987, Lynn Welding diversified by offering precision machining with the addition of Joe Inglis, Jim's brother, and Robert Schoenberger. In 2002, Lynn Welding won Nadcap (National Aerospace and Defense Contractors Accreditation Program) certification for fusion welding, resistance welding, and brazing, three processes that form the core of the company's offerings today. Lynn Welding substantially increased its size in 2017, when it opened a 10,000–square–foot addition to the plant. 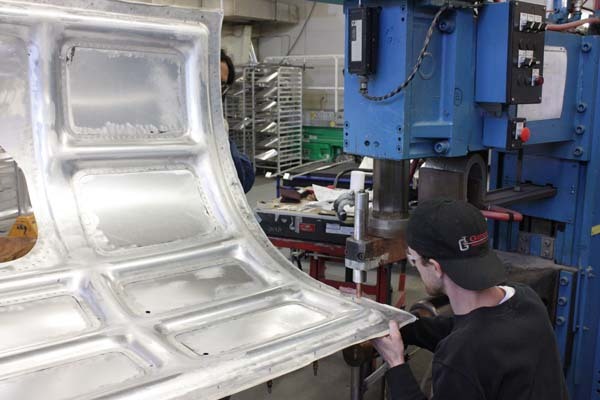 On a recent aerospace application, Lynn Welding had to resistance spot weld two layers of 2024 AL Clad aluminum in the wing section of an aircraft. The surface indentation on the aerodynamic side of the aircraft had to be no greater than 0.002 inch. The weld had to be made through a sealant, and this had to be done to the requirements of Class A specifications. "This was challenging because we had to weld through a special sealant, basically a glue, which was technically a contaminant," Kania said. "This glue was directly in contact with the molten weld pool during the weld process. The major technical challenge was using the proper equipment and technique to provide a consistent spot weld that matched the Class A requirements. In order to get it done, we had to have a custom resistance spot welding machine built for this application. A very strict welding process had to be developed and maintained throughout the entire process. Each part had over 750 spot welds, and each one had to be perfect." The spot–welded wing section was made from a high–grade 2024 aluminum. The sections were custom formed with complex surface contours, which had to be maintained during the entire welding process. On this job, Lynn Welding helped the customer design the components to be welded. "We knew what the shrinkage and distortion rates would be, so we asked the customer to compensate for that by making the parts slightly over sized," Kania said. "This way, after welding and the thermal shrinkage that is inherent to welding, the parts would be in tolerance." Lynn Welding (www.lynnwelding.com) designed, machined, and assembled its own fixturing for the wing welding. The company also designed and spec'd out the custom resistance spot welder that it custom built for the special resistance welding project. "We're fully transparent with the customer–we keep the customer fully involved," Kania said. "It's as if they're taking a walk down the hall of their own factory to their own welding department. We keep our customers informed of their job status on a regular basis and we pride ourselves on being on time with their orders. Customers will typically see photos and even videos of their work being completed, so they can rest assured that their order is in–process and that there are no issues," Kania said. Resistance welding is described by (jobshop.com as the process of bonding two metals without the introduction of a third metal, using an electrode. In order to form a successful bond, the process requires heat, time, and pressure.